Bring more attention to your eyes, for they are the focal point of your face. 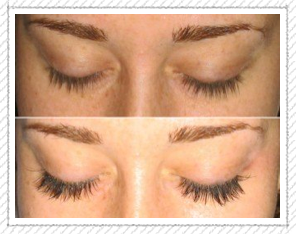 For a natural, healthy, beautiful, fuller lash line we apply a synthetic or silk eyelash extension to your natural lash. Wake up looking and feeling bright and fresh, without makeup! Because the bonding agent is water proof, you are free to shower, swim, exercise, without worry. Call for details, your consultation is complimentary.